Washington, D.C., public schools have declined to apply for a chance to perform at President-elect Donald Trump's inaugural parade this year, NBC Washington reports. As the news station notes, at least one District public school marching band has performed in the past five parades, but none seem eager to follow up for the upcoming one. The Ballou High School's Majestic Marching Knights performed at President George W. Bush's second inaugural parade and followed up by coming out for President Barack Obama's second inaugural parade. The band, however, decided to take a break in January and declined to play at the parade after several recent performances, the principal said, according to NBC News. Dunbar High School's band, which performed at Obama's first inauguration, also passed on the opportunity, with its principal saying that the school is rebuilding the band. Eastern High School also gave a hard pass, although its principal did not explain why. According to NBC Washington, a D.C. Public Schools spokesperson said that she was not aware of any District band that had applied to participate in Trump's inaugural parade Jan. 20. Public school bands in surrounding counties, including Arlington County and Prince George's County, also declined to apply, District representatives confirmed. The University of Maryland, College Park, which performed in 2013, has also opted out. 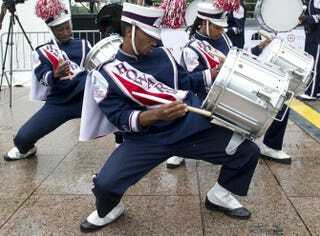 Howard University's marching band did not apply to march in Trump's parade, either, with band director John Newson saying that the band did not have enough members and was facing budgetary issues. Newson did tell NBC Washington, however, that he suspected that many band directors' and school administrators' political beliefs may have factored into the sudden disinterest. "I think everybody knows why, and no one wants to say and lose their job," Newson said. Students at D.C.-area schools did make their opinions quite clear last month following the election, with several students from different area schools walking out of class and staging protests over Trump's win. However, NBC notes that it may not just be politics that is playing a part in the bands' lack of interest in participation but, rather, an unwritten rule of the band world. According to University of Maryland band director Eli Osterloh, after performing at an inaugural parade, some bands choose to wait about 10 years before applying again in order to give other applicants a fair shot.